Isn’t Samson contributing to the homeless problem by destroying all the homes? Samson rejects your petty “logic”! Look at those curls, the man can clearly do no wrong! Now, time to go destroy more homes where the homeless are living. Maybe he figures that if he wrecks all the houses in the world, the word “homeless” will lose all meaning. …I’m sure it made more sense in his head. …He’s getting free again? They’ve thrown houses at this guy before? I recently read (okay, skimmed) an article in Time Magazine where the talking heads were actually advocating for the government to start bulldozing foreclosed homes to drive up prices and jump start the construction industry as a solution to the bad economy. Sampson was just ahead of his time. Jeff – If Samson can defy gravity then he can certainly defy logic. Doornik1142 – Good thinking. Words are just symbols that represent concepts which in turn are given meaning by context. Take away context and the concept becomes meaningless. Bael – That’s the sort of forward thinking that made this country great. But they should take it a step further. The government should pay construction companies to build houses for the express purpose of being torn down by publically subsidized demolition crews. You’d be giving the construction and demolition industries a big boost and cutting costs/maximizing efficiency by eliminating the middle man (you know, the consumer). Sutter_Kaine – Somewhere I’ve got a D&D supplement on the Nine Hells, which includes the city of Dis. The city is constantly under construction for the amusement of the ruler and the torment of the petitioners (i/e the damned) trapped there. A bit of flavor text has a demon construction foreman urging his workers to hurry up and finish their paving job before the next crew arrives to tear it all up. 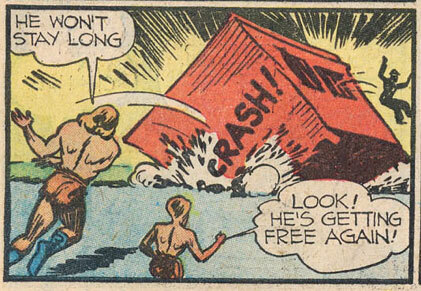 It looks as though the impact of Samson throwing his house has caused the guy to be launched out of it. Some kind of spring system, perhaps? Also, HeroMachine’s been acting a little weirdly recently. The menus have been going odd. They appear blank, then they don’t when I re-open them. Any idea what’s happening? Bael – Once again the wisdom of D&D shows us the way. So, Samson’s going to solve the homeless problem by crushing homeless people with houses? That’s irony. Is it just me or is mr. shadowy guy “escaping” straight through the bars on that building’s windows?